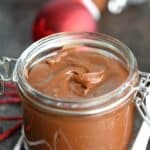 This Chocolate Spoon Fudge in a Jar is the perfect holiday gift, it comes with it's own spoon! It's rich and creamy, and sure to be loved by everyone. Place the sugar, milk, corn syrup, chocolate, butter, espresso powder and salt in a 2 1/2 quart sauce pan. Stir mixture over medium heat until the sugar is dissolved and the chocolate is melted. Continue to simmer, stirring occasionally until mixture reaches 236 degrees, soft ball stage, and remove from heat. Let mixture stand WITHOUT stirring until it cools to lukewarm temperature. Beat fudge with a hand mixer until it loses it’s gloss. Stir in the vanilla and carefully pour into jars. Gently tap jars on work surface to remove air bubbles.